When women give, they give big. That’s one of the findings of the TD Bank Report Time, Treasure, Talent: Canadian Women and Philanthropy, which reveals affluent women donate a bigger proportion of their assets to charity than men. And a life-changing event — a birth, a death or a health scare — is one of the biggest motivating factors that prompts a woman to give. For female donors, opening their wallets starts with opening their hearts. That’s certainly true for Gail Regan, the 73-year-old retired vice chair of Cara Operations, which operates the Swiss Chalet, Milestones, Harvey’s and Kelsey’s restaurant chains. Her life-changing moment occurred during the stressful birth of her first child at Women’s College Hospital in 1964: “I had no idea what I was in for. The pain was over the top.” She was given Demerol, which temporarily affected her ability to speak properly and didn’t help the pain. “The doctor realized the distress I was in and gave me an epidural. It felt as though I had been saved. That’s when I knew this was an institution that really cares.” At that time, Women’s College Hospital was one of the only hospitals to routinely offer epidural pain relief to women in labour since there was still reluctance among obstetricians to do so. That experience set Regan on the road to becoming a major contributor at WCH. She first became a member of the hospital board when she was just 34 (11 years later she would chair the board). Before this, her mother chaired the board in the 1960s and her grandmother also served as a volunteer. “My mother was a feminist as am I,” she says, pointing out that unequal treatment of women extends to the healthcare system. “That’s why it’s so important to have a teaching hospital, which WCH is through its affiliation with the University of Toronto, that’s well funded — so you can give prominence to programs of importance to women,” she says. She also points to the trailblazing work of psychiatrist Dr. Simone Vigod, lead of the Reproductive Life Stages Program at Women’s College Hospital, whose research discoveries focus on optimizing outcomes for women with mental illness during the pregnancy and the postpartum period. Dr. Vigod’s research has found that one in five women experience significant mental health issues during pregnancy, post-partum or early motherhood, making it one of the most common complications of childbirth. “Pregnancy and childbirth can make some women vulnerable and Dr. Vigod’s research is raising much needed awareness among other medical practitioners and in the community,” says Regan. That bigger step includes her recent appointment to the WCH Foundation development committee as well as a substantial donation to support the new Peter Gilgan Centre for Women’s Cancers, an unprecedented new collaboration between WCH and the Canadian Cancer Society. Daniels is supporting the Centre because of its groundbreaking work in educating women on preventative measures they can take to keep themselves and their families healthy, and because it has a vision to transform care for women’s cancers by sharing its research with healthcare facilities across the country. “I’m passionate about preventative medicine, and the work the Peter Gilgan Centre is doing goes beyond the walls of the hospital — it’s about improving healthcare for all Canadians,” Daniels says. There’s no other hospital like WCH in Canada — it’s revolutionary and innovative in ways that many hospitals aspire to be. There’s no doubt Dr. Stowe would be proud of the influential female philanthropists such as AyoubZadeh, Regan and Daniels who are working to maintain her legacy of advancing healthcare for women at WCH. 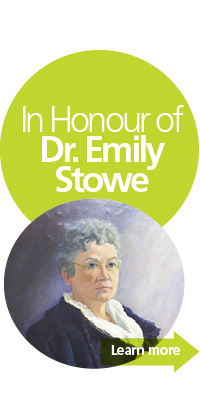 Ask any of the female philanthropists who give so generously to Women’s College Hospital (WCH) why they do it and it isn’t long before one particular woman’s name comes up in the conversation: Dr. Emily Stowe. Dr. Stowe showed them. A lifelong champion of women’s rights, not only did she become the first woman to practice medicine in Canada, but she also founded Woman’s Medical College, Toronto’s first medical school for women and a predecessor to Women’s College Hospital. In 1909 a group of prominent Toronto women formed a committee to create the hospital because they saw the need to advance and advocate for the health of women. Just as that group helped bring WCH to life more than 100 years ago, many Toronto women today from all walks of life are the lifeblood of the hospital’s fundraising efforts, giving a portion of their wealth, time and advocacy to ensure the health of women in the community. These female philanthropists dig deep because they want to make a difference. And because they are inspired by the activism of Dr. Emily Stowe.